Get up close and personal with the diverse birding scene in midtown Manhattan. Over 11 species of migratory birds have been spotted in Bryant Park, including catbirds, ovenbirds, northern parulas, song sparrows, common yellow-throats, yellow-bellied sapsuckers, as well as a wood thrush and in a remarkably rare sighting last fall, a prothonotary warbler. 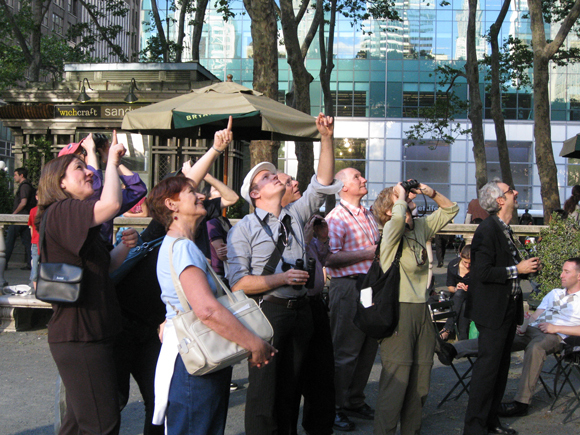 Beginning next week, expert birder and New York City Audubon Society Senior Naturalist Gabriel Willow will return to lead our Birding Tours of Bryant Park on Monday mornings and Thursday evenings during the spring. The tours will be conducted at a beginners pace and touch on all aspects of bird behavior from nesting and mating to migration and identification of specific species and genders. Stop by for a new perspective on nature and wildlife in the middle of the concrete jungle.